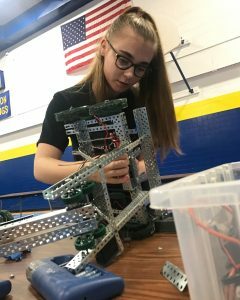 Meet FIRST Robotics Competition Team 4384 alum Danielle Boyer! We found her through an article written about her experiences by SOLIDWORKS. We had the pleasure to interview her to share her story. My name is Danielle Boyer, and I am FIRST Alum. I attended Troy High School for two and a half years and was previously homeschooled . 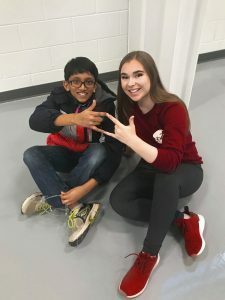 I am currently mentoring the students of FRC Team 4384 Benzene Bots at International Academy East, I am an Ambassador for the LGBTQ+ of FIRST, and I help many FIRST teams in my community to varying degrees. I am taking a gap year to continue to develop STEM in my community. I will pursue business and electrical engineering next year at university. I am proud to have had a large impact on the number of girls in STEM in my community. In 2016, FRC Team 4384 had 1 girl, and in 2017, there were 10 girls. I also helped start an all-girls FLL team. It has been remarkable to see the impact that girls can make on a team, and on their community. 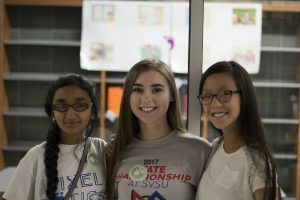 I have also had the opportunity to host a conference on branding at the FIRST Detroit World Championship in April, was featured in a SOLIDWORKS Women in Engineering Blog post, spoke at the 2018 SOLIDWORKS User Advocacy Day Event, I will be a coordinator for my local high school OCCRA (Oakland County Competitive Robotics Association) program, and have helped with the new OCCRA program for middle schoolers. I have been blessed to have been built up by amazing women in STEM, especially women from FIRST, SOLIDWORKS, and my local community. Their guidance has made me a stronger person. They understand where I come from as a girl, especially because being a girl in STEM isn’t easy. Sometimes, people won’t respect you or your decisions solely because of gender. I had to take advantage of every opportunity that I could and work hard to prove that I knew what I was doing. This included pulling frequent all-nighters to finish work, asking teachers to proofread our documentation, and spending hours working on our CAD drawings. If I didn’t know how to do something, I would teach myself. It required time and a burning desire to bring STEM to my community. How has FIRST helped you accomplish your goals? I joined Benzene Bots with an interest to help my community, but little did I know that joining would springboard me into many more projects to be of even more influence to my community. FIRST is important for females because it shows girls that their future is limitless, and that they can pursue whatever they want to, and that they can be leaders. 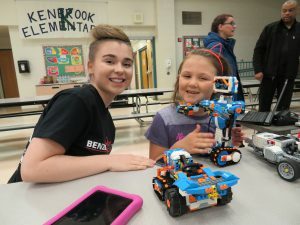 I’ve been questioned by young girls if “FIRST/robotics is for girls”, and that question saddens me. Seeing girls involvement in FIRST is important to me because they are going to build the future! I think that FIRST gives girls the confidence to be authentic and brilliant. I think that FIRST gives girls the confidence to be authentic and brilliant. Every opportunity I have been given through STEM so far has been by a woman. Seeing women build each other up warms my heart, and we need to keep recruiting female mentors, volunteers, and students! I am in the process of initiating an organization called The STEAM Connection to bring STEAM to young children all over the world through coloring books that teach STEAM skills. The books will not include words so that they can be sent anywhere in the world. I am working with both students and K-12 teachers to create these books. My goal is that students (especially the FIRST students) can bring these books when they travel to help that community inexpensively. The intended release date is November 20th, 2018. 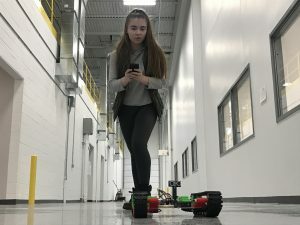 I want to continue to inspire other women to join FIRST and keep on building from the 10 girls currently on FRC Team 4384, as well as help start more all-girl teams in my city. This upcoming summer, I plan on hosting a few all-girl STEM camps on CAD and programming. I am Ojibwe (Native American), and there are limited STEM programs on the reservation. I want to increase STEM accessibility by bringing educational resources there in the future. If they are able to join or start a FIRST team, then they absolutely should do that! There are so many resources online to start or join a team, and it is an experience that they will not regret. Meeting other people who are interested in technology through social media can create a support group that will help them build their skills. If they have a passion, interest, and a drive then they will be successful in their goals to learn and better themselves! My position allows me to work side-by-side with some of the most remarkable people in STEM and to positively impact the students of my community. 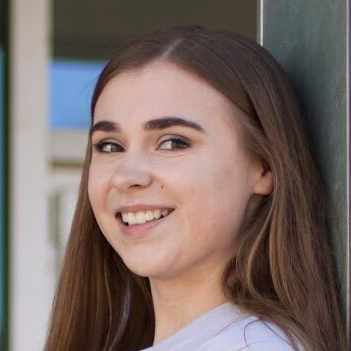 I have been able to help decrease the stigmatization of females in STEM, increase STEM accessibility, and through my high training involvement with the teams I mentor/help I’ve been able to positively change the culture of the teams and the student’s futures. In starting a business team on FRC Team 4384, I have been able to change the perspective of the relationship between engineering and business. I have been able to help change the culture around general proficiency in STEM (programming, CAD, etc. ), as well as specialization, and not one over the other. Having a strong relationship with the people I work with is something I value strongly; seeing the results of increased interest in FIRST, STEM, and business brings me great joy and shows me that I am doing the right thing with my gap year. I am so glad to give back to the team I graduated from and back to the community that I grew up in. Danielle is really passionate about the EKGAR project, Every Kid Gets A Robot (FRC Team 4384). EKGAR’s goal is to increase STEM interest by bridging the gap between a plan to start an FLL team, and actually starting one. EKGAR’s low price allows for teams to use it as an accessible training supplement, and begin to bridge the programming gap between FIRST programs. Learn More about their team and this project.